I have been blogging one year now. Thanks to EVERYONE who stops by this blog each week! I want to give a special thanks to my friends “PJ” and Jennnifer, with “Our Hope Still Endures” (a wonderful blog about her life in general and her struggles with infertility & adoption), for encouraging me to blog over one year ago. Some of you leave comments and some of you just read. I appreciate both! The comments help me to gauge how much of my inner nutcase I should let out on this blog each time and lets me know you “get” me. To be honest with you, lately I have been wondering if I should continue doing this blog thang. I absolutely LOVE to write and it is a lot of fun for me, but…I sometimes question the purpose behind it. Couldn’t my time be spend doing something more productive? 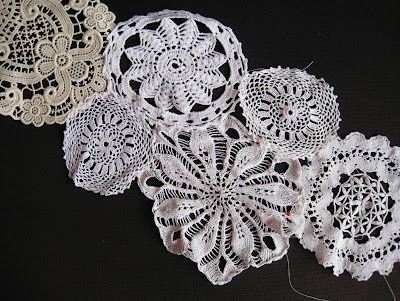 If I didn’t blog, I would probably have learned to make doilies by now. The world needs more doilies and look at me!!! I’m blogging when people are out there without doilies!!! Also, I sometimes feel badly that I DON’T write about my children specifically. Do I not love my children as much as the “mommy bloggers”?? I want you to know that I absolutely ADORE my boys. If I could bottle them both up with all the hugs, kisses and laughter they provide and send it to you, I would. I know that you would so enjoy spending a day with them. They are funny, funny little dudes who are absolutely treasures to me. Just the other day after spending a week home with me because he had the flu, my 6-year-old told me, “I love you how you were made by God” and “I will miss you when I am an adult”. I will tuck those words away in my heart for the rest of my life. It took us so long to have any children at all. I never thought I was going to be a mother and it devastated me. My heart aches for those out there who so badly want to have a baby and have not been able to yet. So, you see? I can be serious! I have serious thoughts and opinions and all of those emotional, serious things. But, this blog isn’t that. It’s not serious…and I am glad you read it just the same. I love how all of you were made and I consider it an absolute privilege that you read my words at all.